Ben Flower feared he would miss out on Wigan's Grand Final charge. The Welsh prop returned to the line-up to help the Warriors book a spot at Old Trafford with a 14-0 win against Castleford. 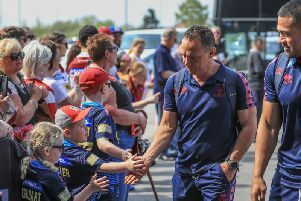 He had missed the previous three matches with a back injury and said: "When we had the team run before we played Hull last week, I was struggling, I had no chance. "It was in the back of my head a bit, thinking ‘I’m not going to make the Cas game now’. "I just rested up and did all the right things I could – and in the end it was fine." Flower provided one of the flashpoints of the first-half with a 40m break which had the home fans on their feet. But he had sympathy for the two front-rowers who have been squeezed out of the side at the crucial stage - Taulima Tautai and Gabe Hamlin. "It's a shame because they have been playing so well," he said. "Gabe’s family came over, which made it really disappointing that he had to miss out. "But he’s a young kid and has so many years ahead of him." Flower was one of Shaun Wane's first signings when he took over as head coach. And the barrel-chested prop says sending him, Sam Tomkins, Ryan Sutton and John Bateman away as Grand Final winners will provide extra motivation. "This whole campaign is about getting to the Grand Final and winning it," he said. "If we do, it extra’s special for Shaun and obviously the lads who are leaving because they are big players who are going to be hard to replace. We are desperate to send them out on a high. "We need to go out on a high this week now. Shaun's just inspiring and ultimately that is what he brings." He was in the side which beat Warrington in the title-decider two years ago and having watched their 18-13 win at St Helens in Thursday's semi-final, he says they will need more than desire to get the win. "I thought they were awesome on Thursday night and I thought Saints were as well – it was probably the best Super League game of the year," he said. "It could have gone either way but fair play to Warrington, they have got some experienced boys in their team. "Warrington are a better team now than they were two years ago. It’s going to be a very tough game for us." Meanwhile, John Bateman will discover tonight whether he has won the Steve Prescott Man of Steel. He is on a three-man shortlist with St Helens duo James Roby and Ben Barba. The winner is crowned at an awards dinner in Manchester this evening - hours after a Grand Final media conference at Old Trafford involving key players from Wigan and Warrington.